Janet Blount is a licensed Certified Public Accountant as well as a Certified Professional Coach and Career Development Facilitator. She has an undergraduate degree in Economics from Agnes Scott College and a MBA from University of Baltimore. Janet has experience in banking, as a Federal government auditor, a Financial Advisor and as a Compliance Manager for an international brokerage firm. She also received the President’s Community Architect of the Year Award from the American Institute of Architects – Baltimore Chapter as their outreach program volunteer team leader. 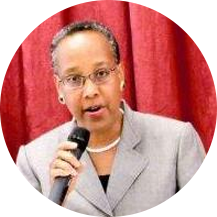 She is the former chairperson of the Maryland Career Development Association’s Mentoring and Outreach Committee. Janet has partnered with schools and non-profit organizations to create career exploration opportunities for students. Janet designed a Career Exploration Program for Parents, Grandparents and other Caring Adults. The 2 hour workshop provides the skills, tools and confidence to guide elementary, middle, and high school children in exploring various career options. Janet learned that aware parents can help their children make smarter career decisions with a brighter long-term outcome. Today, through her personal coaching for parents or her popular workshop, Janet will prepare you to guide and support your children toward future career success! Contact Janet Blount today to learn more about the best option for you!